The Col d'Aubisque is another famous climb from the Tour de France, but it is also the prettiest mountain pass I have ever seen. The ride up to the col is actually two cols: first you summit the Col du Solour, which itself is spectacular, and then you cross a "balcony road" on the way to the summit of the Col d'Aubisque. This first photo shows Val and me at the summit of the Col du Solour, and the second shows the balcony road beyond it (the road is the little cut out in the middle of the mountain). As you can see it was a clear and sunny day, and quite warm in comparison to our earlier days. Balcony road are roads that are built into the sides of steep cliffs. Here are pictures of a tunnel and Val on the balcony road, taken by the GoPro mounted on my handlebars. 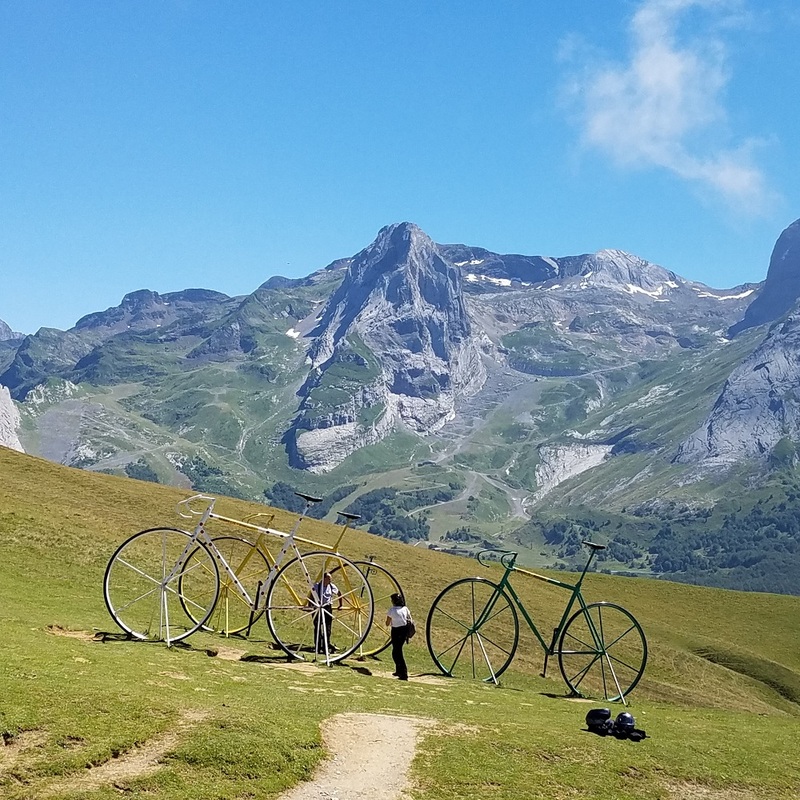 And here's the summit of the Col d'Aubisque and the famous oversized Tour de France bicycles. Of course a ride is not always mountain passes, and today we passed through several quaint villages along the way, including this one. Unfortunately I can't upload my video from yesterday but I do have video and will share it asap. Today is another beautiful day and we're off to the Cirque de Gavarnie, a UNESCO World Heritage Site with Europe's tallest waterfall.